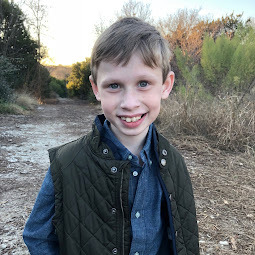 Bennett Brinson Gamel: Fighting Cystic Fibrosis: Our best day yet! Yesterday was a very good day! Bennett was able to start his chest percussion treatments, the Vest again. The picture above shows just how well he is doing. He was being very silly and decided to pose like this on his own. When I tried to adjust his mask, he cocked his head and said, "I know what I'm doin' lady" and then cut up laughing. Clearly our old Bennett is back! 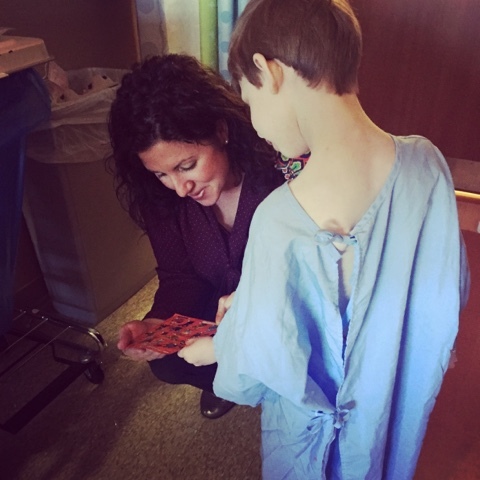 Our morning started out with an X-ray, which came to his room. Everything seems to show his abdomen is doing well. 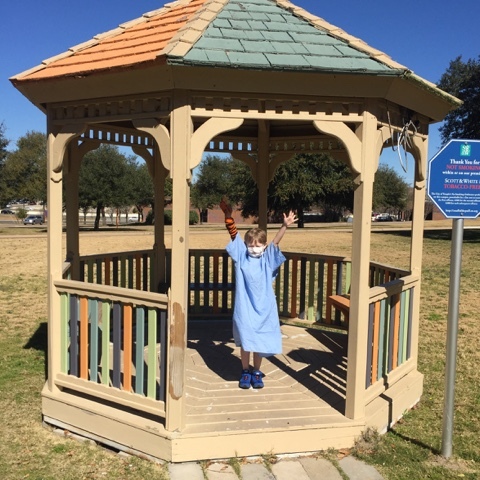 After our Pediatric Surgeon came by for a visit, Bennett was untethered from his IV fluids, placed on a normal diet and encouraged to go outside and play. We had a mid-morning visit from a dear friend from Waco who brought breakfast and goodies (speaking of goodies, we have received so many gestures of kindness in the last two weeks - we are hopeful that those who have showered us with love would know just how appreciative we are - our hearts are full of gratitude!). It was nice to have a few minutes to chat with another adult. We have had two other visits from close friends since we have been in the hospital whose pictures I forgot to capture. I was thankful to have my friend Rachel come today, on a good day, as it is easy to enjoy friendship when one's heart is happy. Bennett was able to go outside today. His first time since his surgery two weeks ago. The Texas warmth in January was glorious. 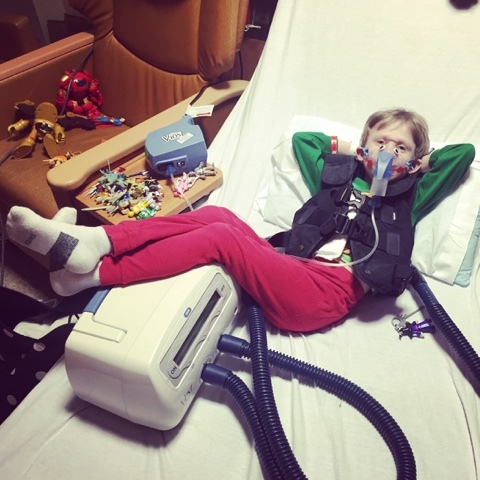 As a precaution, when Bennett is outside of his room at the hospital, Bennett has to wear his mask to prevent his getting any bad germs that would hurt his lungs. He can take the mask off outside but his light blue eyes actually tolerated the sun better with the mask. 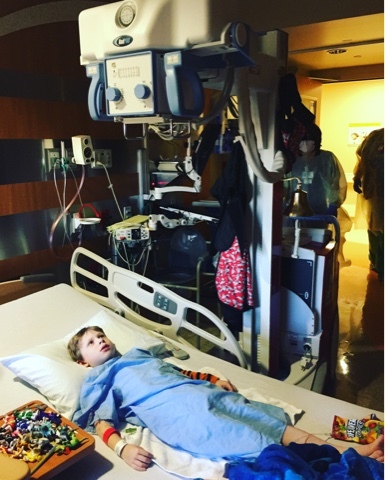 Bennett's pain gradually went down throughout the day, eventually moving to a "0" by noon. 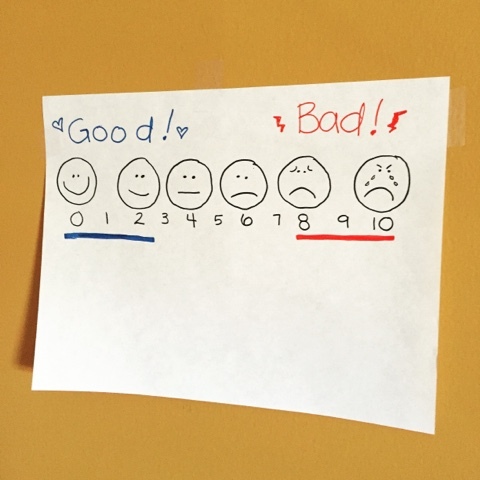 This is the chart that I had originally placed on the wall across from his hospital bed for us to use to identify his pain. This was particularly important when I felt the doctors were dismissive of his pain. The more he could quantify how he felt, the better it was for everyone. I overheard Bennett tell our friend today: "At first, I was a 10. Then I was a 9 and then an 8. I stayed an 8 for a while. Then 7 and 6 then 5 and 4, lots of 6s and 4s. Then I was a 2 and now I am a 0!" It was great to hear him articulate what life has been like for him. 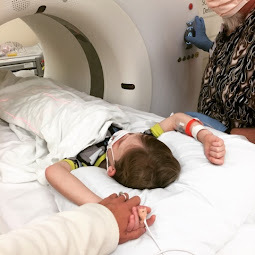 Bennett was able to go most of the day with no pain medicine, although we used Hycet and Tramadol to address any breakthrough pain. 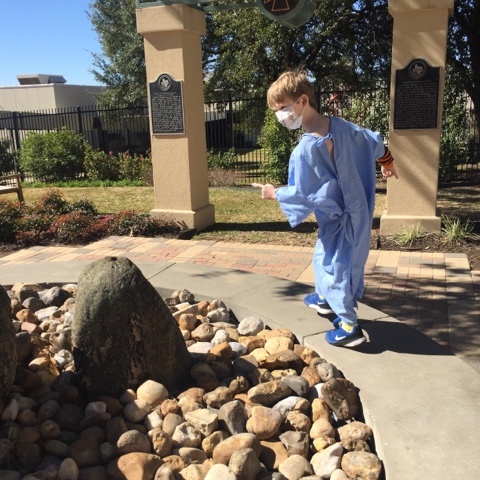 This picture is of Bennett trying to run in his hospital gown. He is holding his little finger out because it has tape and numbing cream on it as he was supposed to have blood work done once we returned to the room. I loved seeing Bennett have enough energy to run. 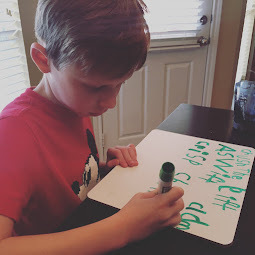 I was surprised to see how much energy he has since the child has not eaten much in the last two weeks. (I dread to know how much weight he has lost.) But thankfully, we have started back his normal g-tube regimen so hopefully we can get his nutritional status improved. Yesterday afternoon, my mom came again to watch Bennett for me. I could have driven home but I've banned myself from driving as I am too sleep deprived. 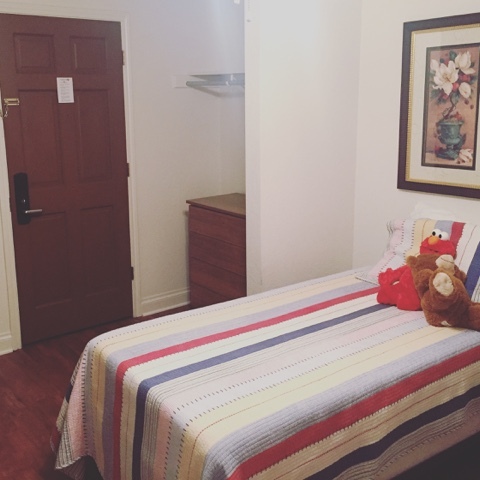 Instead I asked the social worker to arrange a room at the Ronald McDonald House here in Temple. There, I was able to get a free room to sleep for a few hours and a bathroom to shower. I am so very thankful for Ronald McDonald Houses. Brian and I stayed in this very same Ronald McDonald House six years ago when Bennett was born. It was strange to go back...yet it was very familiar. I so appreciated the rest so that I could come back and take care of Bennett at night. I seem to be averaging about 3 1-hour naps per night. Yesterday afternoon, Avonlea's preschool teacher texted me that Avonlea had woken from her nap at school screaming, "Bennett!" I almost couldn't believe her. It's hard to realize that even a child as little as 2 can have anxiety over her brother's well-being. 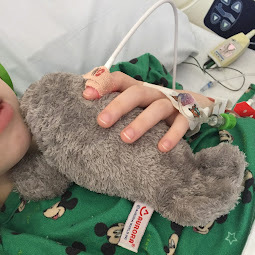 I will sadly admit that she and Oliver had to witness at home Bennett's screams when he was in excruciating pain before this hospital admission. We tried to shield Oliver and Avonlea the best we could but his cries could be heard throughout the house and they went on for much too long. I found Avonlea's teacher's text to me to be bittersweet. How thankful I am to hear her tiny heart is with her brother, even when they are separated. But how sad I am to know that she has not gotten through this experience unscathed, either. I will be particularly attentive to her needs and feelings of safety when we return home. I don't know what today will hold but I'm hoping our successful day might be enough to allow us to go home. I'm feeling ready. I think Bennett is ready. Now we wait to hear if the doctor agrees. Oh, the picture of sweet Bennett outside brought such a smile to my face. I am so glad it appears y'all have turned the corner. Prayers that these improvements continue!!! May relief cover your sweet boy and family! Also -- so glad that you were able to rest a bit and take a hot shower. You are incredible, Breck.